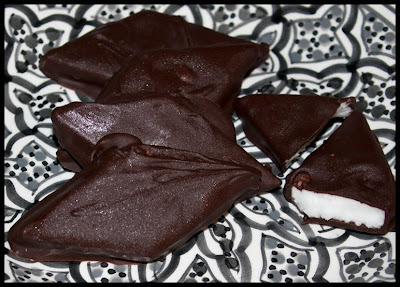 Homemade Peppermint Patties? Seriously? Yes! And you'll be surprised at how easy they are to make. There's no real cooking involved, just melting chocolate. And, these babies are vegan, so they were a perfect gift for my monthly vegan potluck group. I love Junior Mints but I love these better. They taste just about the same except that the homemade version uses really high quality dark chocolate. The recipe is from Gourmet magazine and you can find it here. To keep the chocolate coating looking nice and shiny, you should temper the melted chocolate. I usually don't bother when I'm making treats for us at home, but if I'm giving gifts I do take the extra time. Tempering sounds daunting and it is a pain, but it's not hard, you just need an accurate thermometer. To learn how to do it expertly, watch this video from Cutie-Patootie Jacques Torres.